I loved everything about 45 Park Lane in London, UK, which I have wrote a post when it first opened. It was located in Mayfair, a great location, with rooms looking out at Hyde Park. 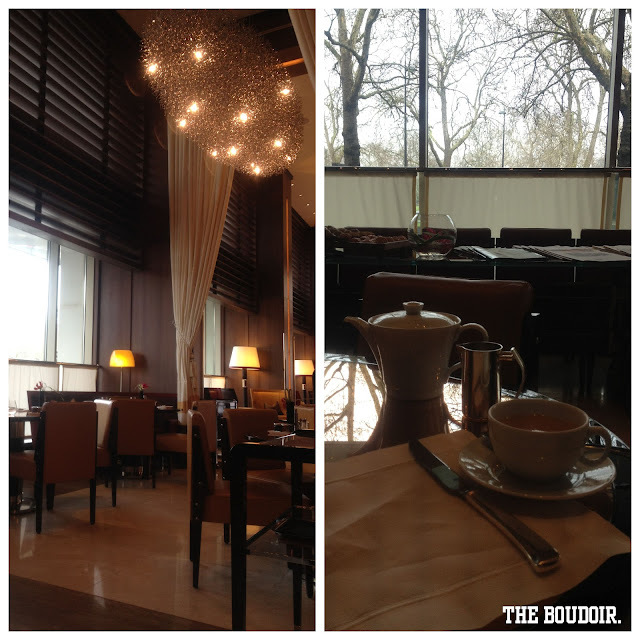 It was a trendy 5 star boutique hotel that was part of a larger hotel, The Dorchester, just steps away. It had Cut, an American restaurant by legend chef Wolfgang Puck, his first restaurant in Europe. The high tech amenities available in the room. The service and the staff. The decor which was Hollywood fifties glam. The spacious bedroom and nice bathroom that has both a rain shower and a bathtub, a high tech Japanese toilet, not to mention a rubber duck. Just like the name suggests, which is the address of the hotel by the way, the hotel has 45 rooms. Lights and air conditioning in the bedroom was accessed electronically by touch screens, either in the telephone or on the wall. There was a TV screen in the bathroom mirror. Bang & Olufsen. A yoga dvd and a yoga mat was available. An iPad is available. DVD player and a movie library. Each room had a Hollywood movie star picture on top of the headboard, and mine was Elizabeth Taylor. The balcony with views of Hyde Park. And if you want a spa, its available at its sister hotel nearby.